I live in North Carolina and the rest of the family lives in Pennsylvania, about 450 miles from here, so don't get home often. 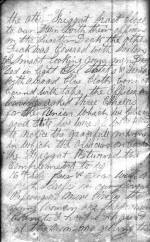 A few years ago I found one of my grandfather's journals in an old trunk. 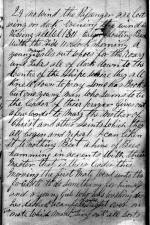 If it were not for this diary I would know very little about the family history. I discovered that my grandfather came from Maybole. In the inside cover of the journal he recorded his name as John Muir followed by what looks like the word Masmrow followed by the town of Maybole and dated September 7th 1859. 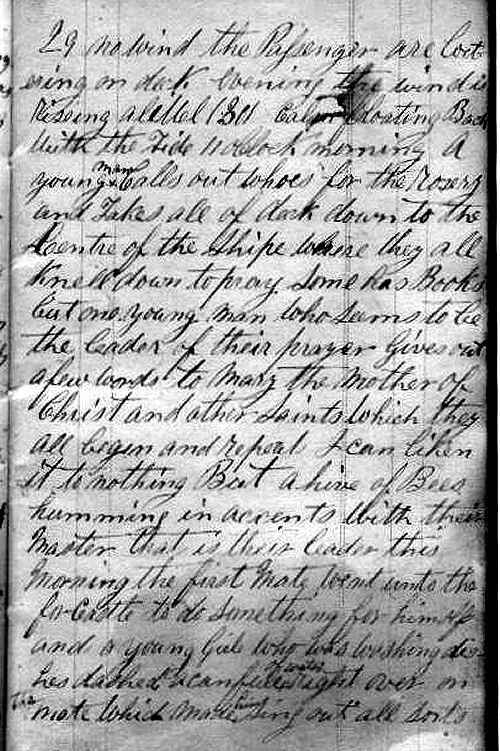 I then found him in the 1851 census of Maybole and learned that he was born Sept 15 1831, the son of John Muir Sr who was born 1807 and his wife Elizabeth born in Ireland in 1799. My grandfather also had two nephews who accompanied him on the trip to America, John Muir born 1846 and Daniel Muir born 1846. 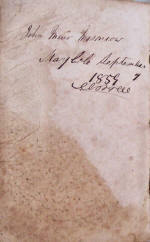 The journal begins with notes of financial transactions, recipes and names of people dating from 1859 -1860. 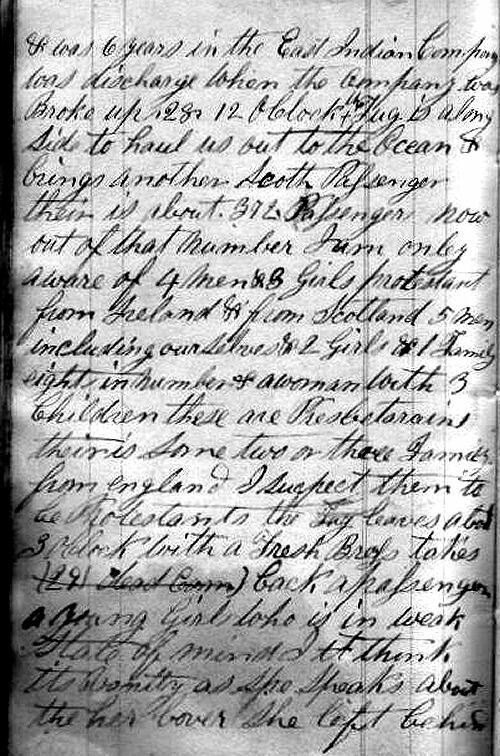 Then my grandfather left Maybole in 1861 at the age of 30 with his two nephews Daniel and John. 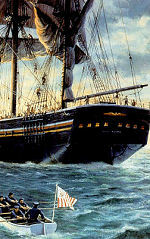 They made their way to Liverpool and purchased passage on a large three-masted ship called the Benjamin Adams. 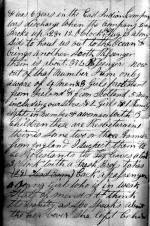 His journal tells the story of the 55 days journey across the Atlantic Ocean arriving in New York three months after the beginning of the American Civil War. He settled in Pennsylvania and is buried there in a Covenanter graveyard. Wes Muir (February 2007). 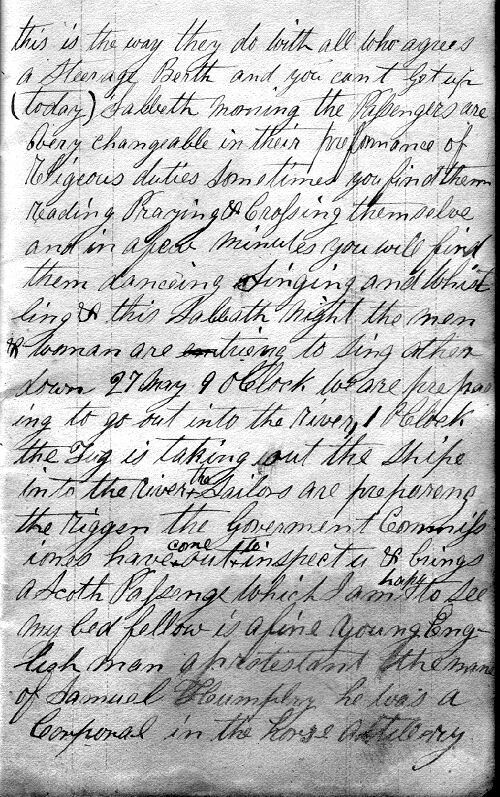 The text below is a transcription of some of the entries in the diary. 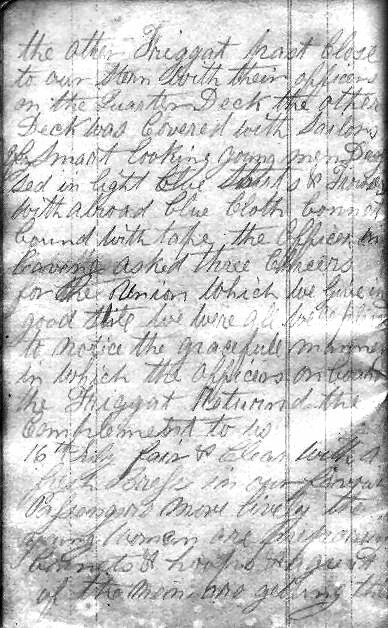 The grammar and spelling are as shown in the journal. 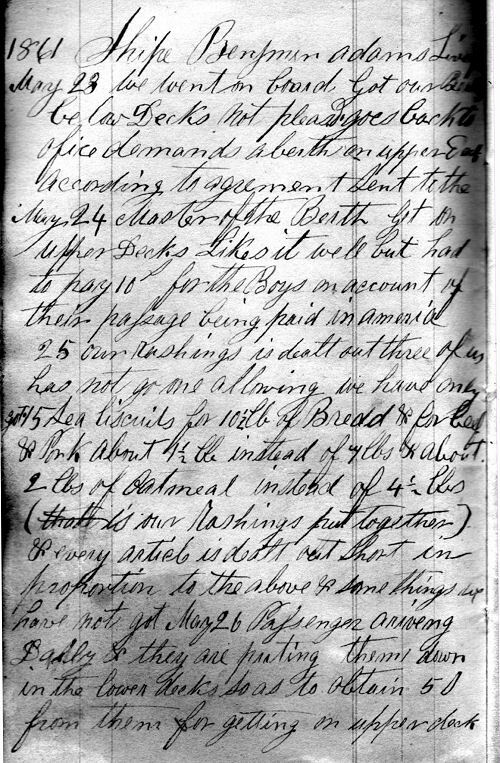 Some of the pages of the journal are shown below in the right hand column. Click on them to view full size. 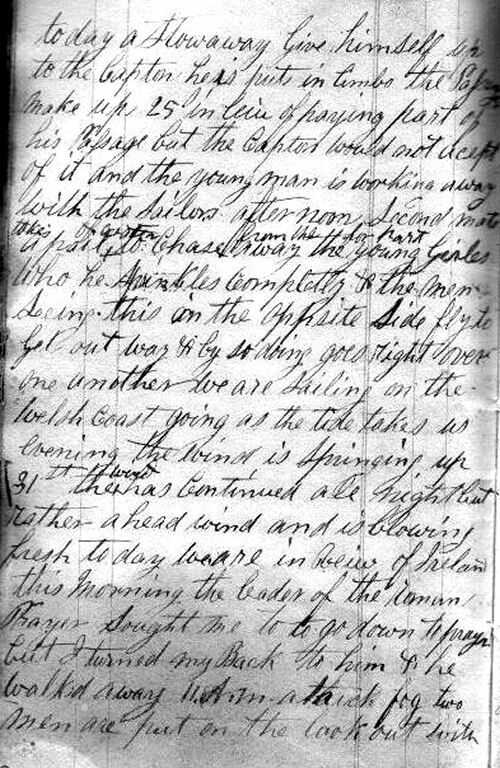 One particular entry of note near the end of the journey is that of 16 July 1861 just after America's Civil War had begun. 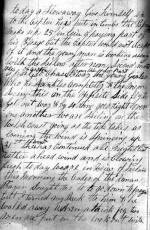 A Union navy ship fired a warning shot at the ship John Muir and almost 400 passengers were aboard. The ship stopped and was boarded by the Union navy which was looking for a Confederate privateer ship called the Jefferson Davis. After inspection the ship and passengers were allowed to proceed to New York and a new beginning in America. 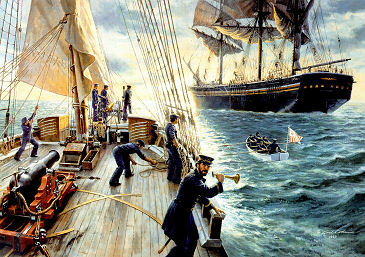 This event was well documented and later illustrated in a painting by Gil Cohen. See below. 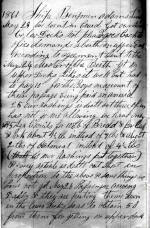 1861 May 23 Shipe Benjamin Adams. Liverpool. We went on board got our bunks below Decks. Not pleased goes back to office demands a berth on upper deck according to agreement sent to. May 24 Master of the berth get [us] on upper decks likes it well but had to pay 10! For the boys on account of there passage be paid in America. May 25 Our rashings is dealt out. three of us has not go one allowing we have only got 5 sea biscuits for 10lb of bread for beef and pork about 1 1\2 lb instead 4 lbs. 2lbs of Oatmeal instead of 4 1/2 is our rashing put together. every article is dealt out short in proportion to the above and somethings we have not got. May 26 passengers arriving daily they are putting them in the lower decks so as to obtain 5! From them for getting an upper deck. This the way they do with all who agrees a storage berth and you can get up. Today Sabbath Morning the passengers are very changeable in there performance of religious duties sometimes you find them reading Praying and crossing them selves and in a few minutes you will find them dancing singing & whistling & this Sabbath night the men and woman are trying to sing other down. 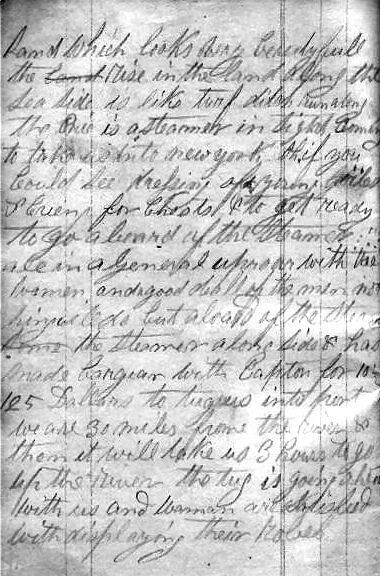 27 May 9 o'clock we are preparing to go out in to the river 1 o'clock the tug is taking us out the shipe into the river the sailors are preparing the rigger the government commifeimos have come out to inspect us & brings a Scot passenger which I am happy to see is. My bed fellow is a fine young English man a Protestant the name of Samuel Fleumflry he was a Corporal in the horse artillery & 6 years in the east Indian Company was discharged when the company was broke up. May 28 12 o'clock the tug is along side to haul us out to the ocean & brings another Scot passenger there is about 376 passengers now out of that number I am only aware of 4 men & 8 girls Protestant from Ireland, from Scotland 5 men including ourselves & 2 girls one family eight in number 7 a woman with 3 children there are prebestarians thinks some two or three families from England I suspect them to Protestants. ------- 3 o'clock with a fresh breeze takes back a passenger a young girl who is in a weak state of mind I it is insanity as she speaks about the her love she left behind. May 29 No wind the passengers are loitering on deck. Evening the wind is rising a little calon floating back with the tide. 11 o'clock morning a young man calls who's for Rosary and takes of dock down to the center of the shipe where they all kneel down to pray. Some has books but one young man who seems to be the leader of their prayer group gives out a few words to Mary the Mother of Christ and other saints which they all began and repeat. I can liken to nothing but a hive of bees humming in accent to there master. That is their leader this morning the first mate went on to the focerslte to do something for himself and a young gal who was washing dishes can full of water over on the mate which made him sing out of sorts. Today a stowaway gave himself up to the captain he is put in limbo the ----- make up 25 in lieu of payin his passage but the captain would not hear of it and the young is walking away with the sailors. Afternoon second mate takes a pot of ----- to chase away from the young the girls who he sprinkles completely & and the men seeing this on the opposite side fly to get out of the way & by doing this goes right over one another. May 30 We are sailing on Welsh coast goig as the tide takes us evening the wind is spring up the wind has continued all night but rather a head wind and is blowing fresh today we are in view or Ireland. This morning the leader of the roman prayer sought me to go down to pray but I turned my back on him & and he walked away. 11 a.m. a thick fog two men are put on look out with trumpets which they blow occasionally 4 P.m. fog cleared off blowing ahead. A few of the women are sick which shows well at the cook house the cooks are leaving duty on the passengers but the caption was told he gave them a scolding for so doing. Good drope of rain today the breeze is rising. 1 June about 2 o'clock this morning I waken with a shout of the passengers & the knocking of barrels & and splashing of water in fear I got in my cloths with all haste, told my two boys to do the same went on deck with all speed but some found all ------. The ship goig though a strong headwind. Went below deck all sick heaving up. Though out this day the shipe kept pitching passenges are all sick. I have went to bed. Dan has give up Johnny's stout. The wind is keeping strong. 5 June Wind is always high and rough I feel very unwell heaving all my meat up. Ship is going at rate of 8 miles per hour. The first Mate says we are 1300 miles from Liverpool. I feel so I must go to bed. 6 June Wind calm sea is smooth I feel a great deal better today. Roman prayers are getting back they where performed in the morning. So at dinner time I was heading in my berth when I heard my Glasgow friend getting a ----up to speak ----- to chastise him for bad conduct & shortly afterwards I arose to come out on deck & in going up I stopped to speak to the adaman afeue. ..... The first mate today got his jacks and some ropes and prayed them right down upon. He says he will annoy them to they go over also he asked me what it was they sprinkled over the berths he said it was holy water for the big beloved The first mate he could piss better holy water. I baked ---- loaf today with eggs butter and sugar. ------ I am a good deal better today. 7 June Very calm shipe going Nothing today happing ---- shout of Porpoises which swim around shipe to night the Romans assemble as usual for prayer & the sailors are called in to join the shipe which is above the hatch where prayer is performed ---------. 8 June light wind passengers allowed up on deck. 15 or 16 July Schooners rigged about 10 miles north of us. Shortly one of them fired two guns which made our Captain concerned less the two lay to us. while they were approaching some thought they were ___ others privattiers but their coulers soon told us they were American Frigates. The first one passed our bow and put out a small boat. One of the officers came along side and came on board and spent some time in the cabin. One of the sailors came out of the small boat and told us that they were in search of a privattier. He said their was ____ while the officer was on board. The other Friggat past close to our stern with their officers on the quarter deck. The other deck was covered with sailors _ smart looking young men. Dressed in light blue shirts and trousers with a broad blue cloth bonnet bound with tape. The officers in ___ asked three officers for the union which we give in good _ we were all _ to notice the graceful manner in which the officers on board the Friggat returned the complement to us. 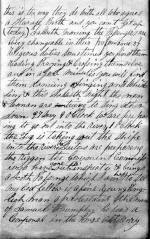 17 July - [Toward the end of the trip the journal describes the preparations for landing. A thick fog has cleared away and land sighted for the first time. The outline of the shore can seen as well as other boats. The sailors are cleaning the decks below which are quite filthy. Passengers are packing their chests for departure and are throwing their dirty mattresses overboard. They are sleeping on the top deck the final night of the journey. Many are up all night in the excitement and anticipation of their arrival in New York. A tugboat is hired by the captain who has stuck a bargain for 25 dollars to take the ship about 30 miles up the river into port, a journey that will take about 3 hours. And finally the woman are preparing themselves and dressing for their arrival in their new home.]. Under the command of Captain John Drummond the full-rigged Benjamin Adams sailed from Liverpool on 28 January 1854 with 384 Scandinavian Saints aboard. Elder Hans Peter Olsen, a missionary resuming from the island of Bornholm, presided over the emigrant company. These Mormons had sailed from Copenhagen on the steamship Eideren by way of Kiel, Gluckstadt, and Hull. After they arrived at Liverpool misfortune overtook them. Sickness broke out among the company and twenty-two children and two adults died. As the emigrants boarded the Benjamin Adams, an examining physician declared fifteen unfit for the voyage and would not permit them to sail with the rest of the company. Although the fifty-three-day passage was described as "very pleasant and prosperous," there were eight deaths (two elderly adults and six children), two births, and nine marriages. The vessel arrived at New Orleans on 22 March. This large three-master, hailing from New York, was built with three decks, a square stem, and a billethead. Among her owners were the Drummonds, including the master, Gilbert C. Trufant, William Tapscott, and George B. Cornish- all prominent in the Yankee sea trade. After fourteen years of service the Benjamin Adams was lost at sea in 1866.
from Ships, Saints, and Mariners by Conway B. Sonne and other sources.